Please take these easy steps to register your account(s) in the Online Banking system. Once you register for Online Banking, you will be able to use all the services and features in Mobile Banking, including Mobile Deposit and more! After clicking "Enroll," follow instructions to set your user preferences. 2. For an even greater convenience download the American First Mobile app from the App Store or Google Play. Make Account to Account Transfers — We make transferring funds easy with just a few clicks. 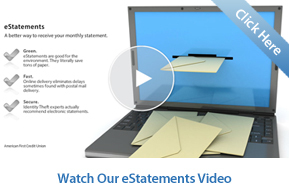 Receive e-Statements and eBills — Go green, more convenient, more secure and easier to manage. Send Money to Friends and Family — All you need is their email address or cell phone number. Reduce the clutter created by paper statements by switching to e-Statements through our Online Banking service. View your spending habits, and build a budget to save for the future. You can also enter accounts from other institutions to get a big picture view of your current financial standing. View all of our Demo Videos including Product Demos, Fraud Prevention Tips, and more at our online Education Center. Download our conversion and troubleshooting documents for a smooth transition. With our Online and Mobile Banking conversion, you will need to download our newest American First Mobile app to continue taking advantage of the convenient features. Get yours on May 13th in the App Store or Google Play!